Sunday's game wasn't pretty, but in the Big Ten, every win counts. MINNEAPOLIS — Two games into his first Big Ten season, first-year Gophers coach Richard Pitino has already learned quite a bit about the new conference. On Sunday, Purdue taught Pitino and the Gophers that no game is over until the final buzzer. Leading by as much as 19 points in the second half, Minnesota let the visiting Boilermakers make things interesting in the final minutes before coming away with an 82-79 win, Pitino’s first in the Big Ten. "You can’t beat yourselves, because the other team will make you pay for it," Pitino said after Sunday’s victory. "Purdue certainly did when we made some mistakes tonight." The Gophers got a big first-half lift from senior Austin Hollins, who scored 13 of his team-high 18 points before the half. Minnesota increased its seven-point lead halftime lead to 60-41 with 11:55 left in the second half thanks to a basket by point guard DeAndre Mathieu. That’s when Purdue crept back into the game. The Gophers’ lead was cut to 10 with 6:24 to play and shrunk to single digits with under three minutes remaining thanks to a Terone Johnson 3-pointer — one of four shots he hit from beyond the arc Sunday. Things stayed close in the final minutes, forcing Gophers players and fans alike to sweat out the end of the game. Purdue center A.J. Hammons scored in the paint with 1:28 to play to cut Minnesota’s lead to four. After Kendall Stephens connected on a 3-pointer, the Gophers led by just three points. But with only four seconds remaining, the game seemed all but over. That wasn’t the case just yet. Malik Smith was fouled with four seconds to play and missed both free throws. Purdue had a chance at the buzzer, but a half-court attempt fell short as Minnesota hung on for the win. It wasn’t pretty, but in the Big Ten, every win counts. "You’re not going to have a team quit on you in the Big Ten, so they’re going to keep coming back at you all the time," said Gophers center Elliott Eliason, who held Hammons to just seven points. "We’ve got to learn to close out games and stick to your principles on defense and know what you’re doing and don’t make mistakes on offense. I don’t think we did a great job of that at the end, but luckily we came away with a win and had to learn the hard way." Pitino felt the first 35 minutes of Sunday’s game was perhaps the best stretch his team has played all year. The Gophers were taking smart shots, hitting from downtown, and getting to the free throw line. 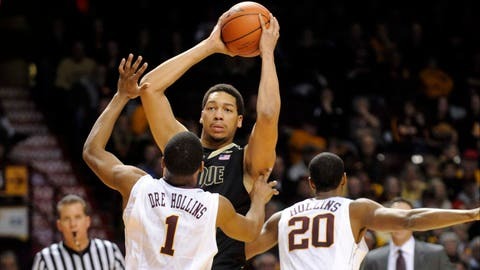 Defensively, they held the Boilermakers in check for much of the game until Purdue’s late rally in the second half. While his team eased up in the final five minutes, Pitino preferred to focus on the previous 35. "I thought we really were playing great, especially offensively," Pitino said. "To do that versus a very good team, we’ve got to be proud of it. . . . You’re up by 19, they cut it to three and you want to focus on the negatives. We’ve got to remember that for about 80 percent of the game we played great defense, we rebounded the basketball, we were really efficient offensively." Just three days earlier, Minnesota suffered a loss in its Big Ten opener against Michigan. It was the first learning lesson for Pitino and his team as conference play began. Sunday was another one. This time, however, the Gophers were able to learn a valuable lesson and still come away victorious. "Coach told us it’s never over," said Mathieu, who had 11 points and four assists in the win. "Don’t play not to lose. Play to win and keep attacking them. We kind of settled and let them drive us a bit in the last five minutes. We’ve just got to keep playing throughout the game and finish out all 40 (minutes)." Minnesota rolled to 11 wins in nonconference play, including one true road win at Richmond. The majority of the Gophers’ victories, however, came at Williams Arena. Pitino’s squad now goes on the road for games at Penn State and Michigan State. With his first Big Ten win in the books, Pitino now has a bit more understanding of what to expect in conference play. He just hopes not every game is as nail-biting at Sunday’s three-point win. "We’ve shown that we can be a really good team if we execute the right way," Pitino said. "I would hope — and it’s early — but I hope that we always give great effort like we’ve done the first two games. The execution certainly needs to get better. Over the last two games, we can really learn from them."